The organization of each liver lobe into structural or functional units related to function and/or disease has been the subject of considerable debate during the past century. Several models, none of which are mutually exclusive, have been proposed as follows and as illustrated in Figure 1. The classic hepatic lobule is a polygonal structure having as its central axis a central venule, with portal tracts distributed along its peripheral boundary. The peripheral boundaries of these lobules are poorly defined in most species, including humans. (In some species, e.g., the pig, there is considerably more connective tissue present in the liver and the connective tissue is distributed along the peripheral boundary of classic lobules, thus making them very distinct.) Considerable sinusoidal anastomoses occur between adjacent lobules, and thus the blood collected by each central venule is supplied by several portal venules. For these reasons, and because of intralobular regional differences in oxygenation, metabolic functions, and responses to some disease, an acinar concept was proposed to define the hepatic functional unit. The hepatic acinus is a unit having no distinct morphologic boundaries. Its axis is a portal tract and its peripheral boundary is circumscribed by an imaginary line connecting the neighboring terminal hepatic venules (central hepatic venules of the classic lobule), which collect blood from sinusoids. 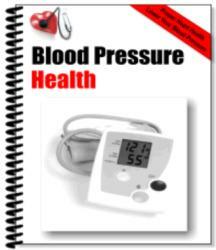 Contained within the acinus are three zones, each having different levels of oxygenation and metabolic function. Although the acinar concept has been widely accepted, it fails to account for those mammalian species (e.g., pig, seal) that have connective tissue boundaries circumscribing the classic lobule. Additional inconsistencies increasingly have been identified in three-dimensional studies of metabolic heterogeneity and microvascular structure. their center a portal tract, with central veins present around the periphery of each lobule. This concept has received little support. Currently, the concept of subunits of the classic lobule forming functional units is the most consistent with existing evidence. In this model, each "classic" lobule consists of several "primary lobules." 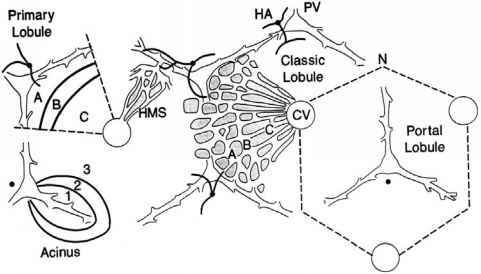 Each primary lobule is cone-shaped, having its convex surface at the periphery of the classic lobule supplied by terminal branches of portal venules and hepatic arterioles, and its apex at the center of the classic lobule drained by a central (terminal hepatic) venule. These "primary lobules" were renamed hepatic microvascular subunits (HMS) and were demonstrated to consist of a group of sinusoids supplied by a single inlet venule and its associated termination of a branch of the hepatic arteriole from the adjacent portal space. Further confirmation of this HMS concept was obtained by studying their development in neonatal livers. Accompanying the HMS are hepatic parenchymal cells and the associated cholangioles and canaliculi. 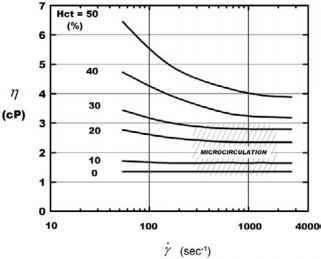 Hepatocellular metabolic gradients also have been demonstrated to conform to this proposed functional-unit concept. Studies using three-dimensional reconstruction of sectioned livers, scanning electron microscopic examination of corrosion casts, and in vivo microscopy of several species support this concept of the functional unit being a conical microvascular subunit of the classic lobule.